Recently, we received a commission for this commercial hand railing project at The Children’s Inn at the National Institutes of Health in Bethesda, Maryland. 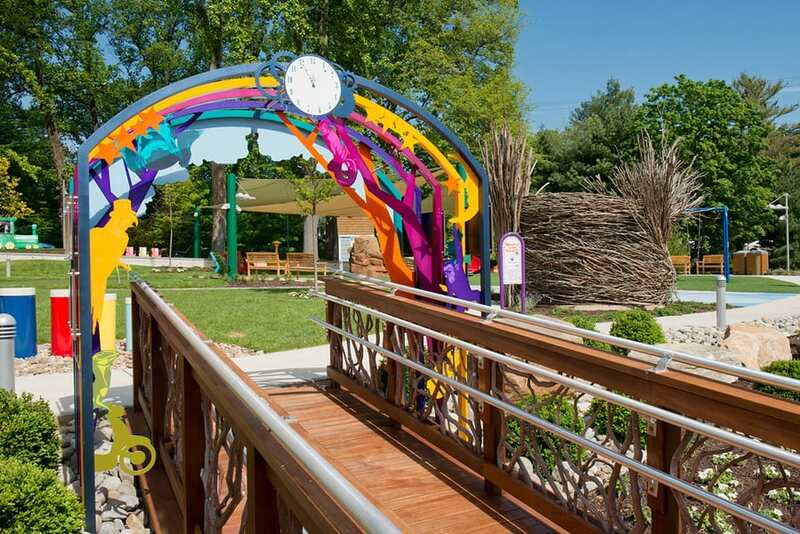 Mountain Laurel Handrails with their twisting twig balusters lend a fun and fairy-tale look to a special play park. Working with a team of professionals, an existing playground was renovated to make it look like a new one. This was a unique and interesting project that included a number of challenges for the team. Throughout the project, there were several minor and major hurdles that we faced and crossed. But at the end, we completed the commercial railing project within the deadline and installed an amazing handrail that enhances the overall appearance of the playground. We successfully completed the project and delivered results that we were expected to deliver. In addition to dedication, there were multiple factors that worked together to make sure we stayed on the right track and built a safe and attractive playground with secure and scenic railings. Mountain Laurel Handrails is an appropriate commercial railing design to match with overall theme of the park. The place where the park is located is really a beautiful region to have a fun place. The noble work of the Inn was also an encouragement for the project. They have been helping children battling against illness. The Children’s Inn at NIH was founded in 1990 with an aim to help those children who are receiving a life-saving treatment at the NIH. The help is given in the form of temporary residence to these children. The playground is outside the facility. 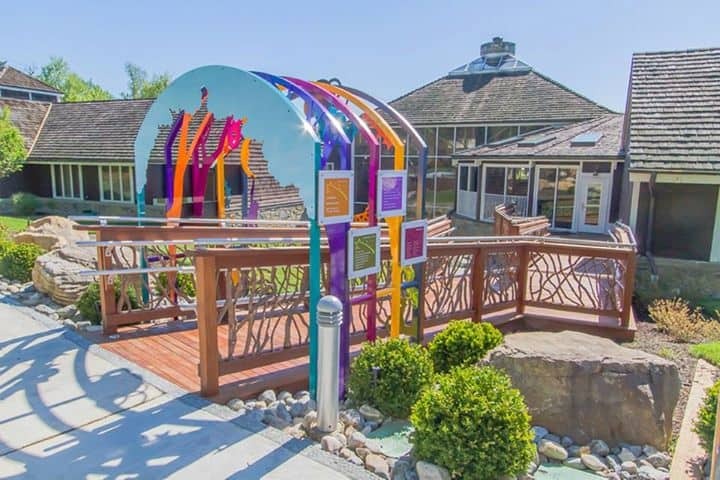 It was built by the Inn with an aim to take the burden of illness from children’s mind and let them have some fun time. One of the most amazing things about the park was its surrounding areas. Beautiful naturalized landscape with lush green and tall grass were adding more beauty to the place. All the team working the playground project needed to do was complement the surroundings with a fun playground. Before beginning the project, the facility’s expected outcomes were clear. It wanted a fun and colorful playground where children can enjoy their time forgetting about their illness. There is a region where a handrail was required. The facility was wishing a magical escape for children from the burden of illness. The facility had a very noble aim for children which was necessary to fulfill. Our job was to install one of the commercial handrails for stairs that could match with other fun areas of the playground while providing safety to people accessing the region. Playgrounds aren’t just to let children spend some quality time outside their homes playing some random games. Many studies and experts call playground an important part of a child’s overall development. Whether it’s a school playground or a play park near the house, a child spends the most amazing time of his life here. Kids learn many life lessons playing on the playground. Several earlier studies have suggested that playtime at a park can have a positive impact on a kid’s life. From physical and social to emotional, there are many things that a child learns on the playground. However, a playground is not just a park with a seesaw or a few chairs. There are multiple things that come together to give a fun and interesting appeal to a play park for kids. It was a unique project for everyone. All wanted to add great things to it for children to have fun here. Mountain Laurel Handrails had the job of providing one of the most secure commercial handrail systems while improving the overall appearance of the playground. Keeping the objective in mind, we started with the project and took the very first step: understanding what to do. A beautiful, useful, and sturdy handrail was in our work list from the very beginning. The designers didn’t want it to be any other ordinary handrail. It is somehow linked to children who are battling against serious health issues and senior citizens who access the park daily. We understood that it will be a handrail exposed to all kinds of weather conditions. We also knew that it should be useful for all. But we wanted to do more than just make it safe. Apart from just a handrail to be grasped to provide stability, we wanted to make it interesting and unique. For that, we had the best materials, mediums, and a team of commercial handrail installers with years of experience in the field. People of all ages are going to use the space, so it was necessary to work on this in a way that everyone could feel secure while walking over or grasping it. Instead of using boring or traditional handrail designs, we decided to brainstorm and find the best commercial handrails and railings we had ever come across. 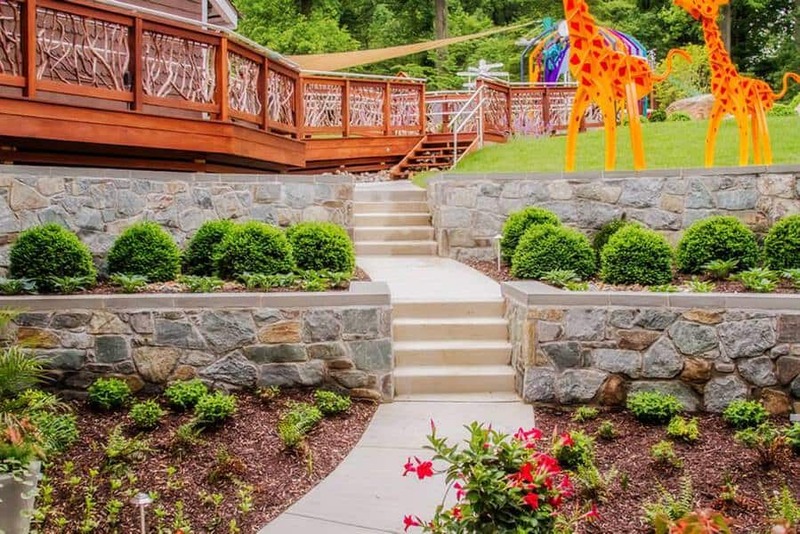 In addition to the specifications, we analyzed commercial handrail code requirements to pick a fun design that could provide safety and attractive appearance to the place at the same time. The handrail project was different for us in many ways. We were working with a team of professionals whose jobs were to change the overall appearance of the playground. Honestly, the park was in need of a renewal. As you notice in the picture below, the park was just a space with some equipment. It wasn’t a fun playground where kids could enjoy their time outside the facility. The team had the challenge to change almost everything in the park and offer it a refreshed and beautiful look. Apart from that, we all wanted to add more fun to the playground. 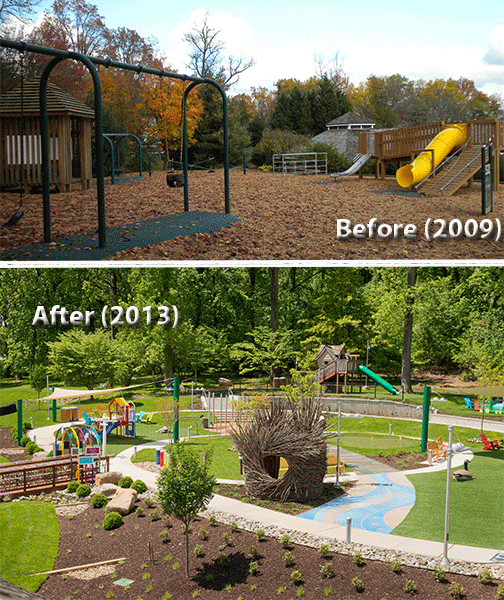 The image below compares how the professionals changed the overall appearance of the park and made it a fun place for children. Before the project, there was faulty and outdated play equipment in the park. Plus, they were limited in numbers. There was also an emergent need of adequate shade. The place was also lacking a concrete path where people could walk. The professionals working on the project observed all these things and found that there are several things to be renewed and many play equipment machines are needed to be added to it. And we provided an interesting handrail design in the mind that we wanted to turn into a reality. In the above image, you will see the difference in the park’s look before 2009 and its appearance in 2013 after the renewal project. With dedication, everyone in the project worked on the planned design and turned into a reality. We wanted to make sure our handrail design matches other portions of the park and complements them. 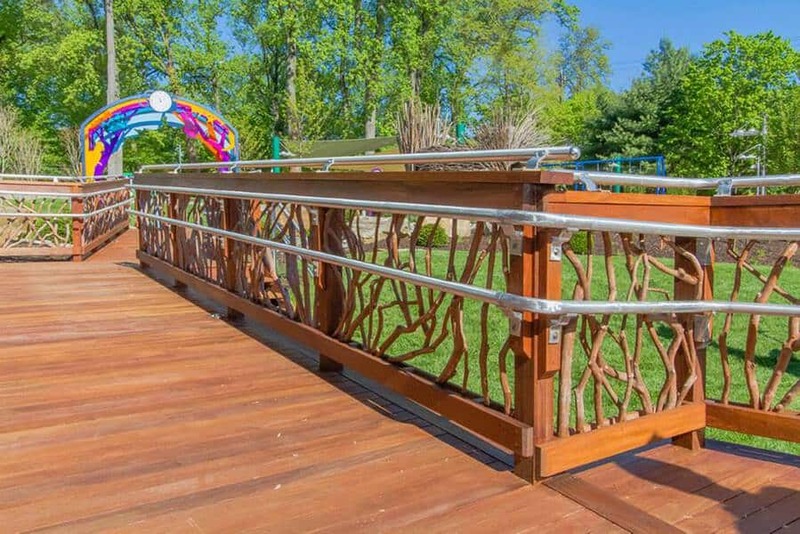 At a time when other professionals were working to replace the outdated play equipment with some high-quality and fun things, our experts were working tirelessly to add a fun handrail to the park. There are a number of things that children can do in the park, including playing their favorite games. In this, a handrail is just considered as a boring and mismatched connector. To make it fun, we wanted to add a unique, interesting, and useful touch to the handrail, but it was also necessary for us to make sure that we do not compromise the strength. As you can see in the image above, the handrail is not just providing the park with a passage but also complementing its overall look. While working on the project, we also considered the park’s surrounding areas. There are lush green regions around the playground which make it a beautiful place to be. It is a not just a fun park for children but also a peaceful place for senior citizens who want to spend some time in the lap of nature while forgetting the tension in their real life. 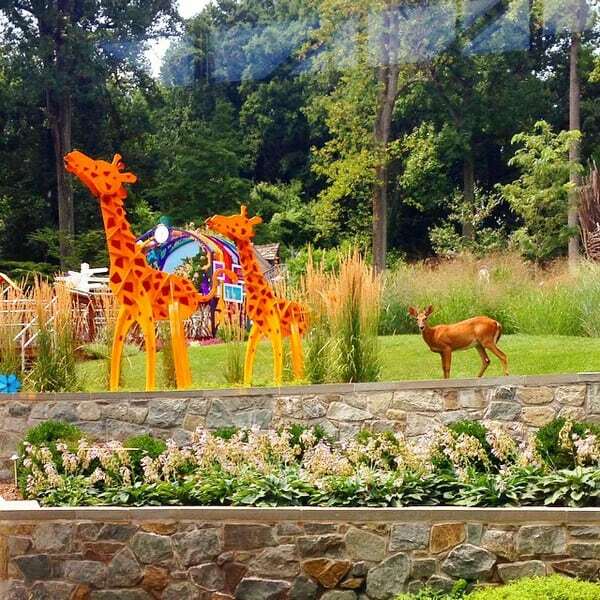 Now, there are colorful life-sized giraffes. 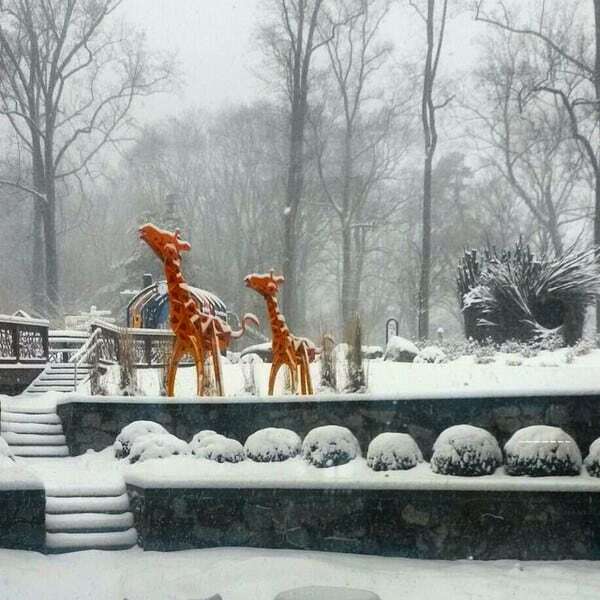 Aren’t they looking like real giraffes? Maybe not, but they are making the place more beautiful than ever. They are adding an interesting touch to the park and matching the landscape around them. What’s more? There is a real-life deer. Yes, it’s a real deer. It creates an adventurous escape in the park and makes the playground more lively for children. The designing team found it fun to work on the handrail section of the park. However, they also faced some challenges that tested their skills and patience. One of them was installing the handrail in a way that it does not block the passage near it. As the Inn playground is situated on a hill, there are ups and downs that were needed to be renovated very carefully. The park is also accessed by senior caregivers and children with physical challenges. It was a tough challenge for the designers to specify a handrail that makes it easy to access the park without blocking the steps near it. But they accepted it and made the park accessible for all. The image above describes the quality work by the designers. 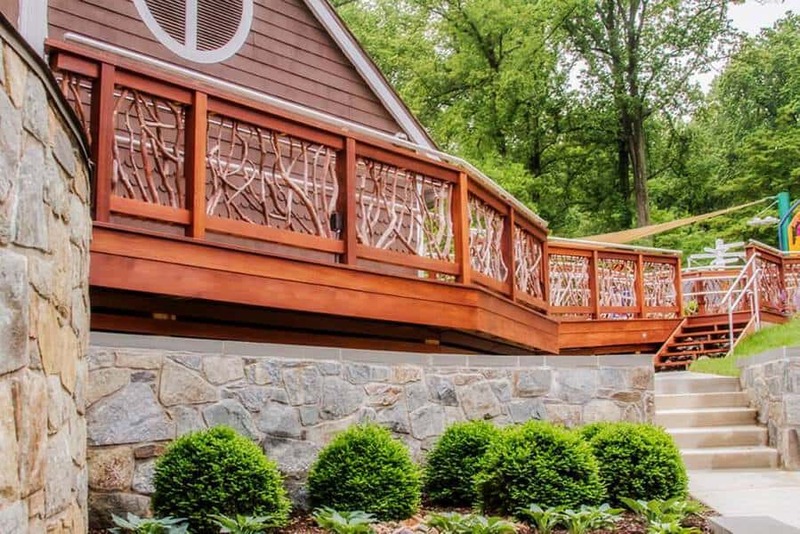 A deck and boardwalk safeguarded with Mountain Laurel Handrails served as the perfect solution. 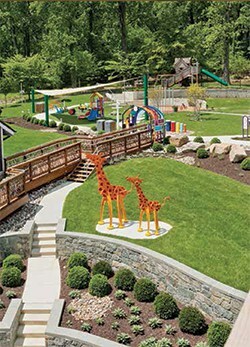 They followed and balanced out the contours of the sloped landscape while connecting the Inn to the playground’s many sections. Apart from designers, installers did their job nicely. In the case of railing’s installation, installers had to work very carefully. They were asked to install it in a manner that it becomes a lot easier for kids and senior citizens to access the railing in any weather condition without any trouble. During the installation, they had to keep one thing in their mind that the Children’s Inn NIH railing will be accessed by children with physical abilities. The image below shows the quality work of installers with years of experience in commercial railing installation. They paid a careful attention to every demand. They used the finest tools to make sure that the railing is safe to access for everyone.